The first issue of the journal Scientia Marina(formerly Investigación Pesquera) was published in 1955. Since then many scientists have worked with enthusiasm to insure continual publication of quality papers and we warmly thank to all of them. 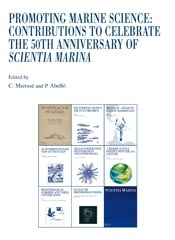 To celebrate the 50th anniversary of the journal we invited specialists on different topics of marine science to present overviews in their fields of expertise. The authors were invited to write their personal experiences, insights and visions; to criticize freely; and to courageously put forward new scientific concepts. With this compilation we wish to stimulate multidisciplinary thinking in marine sciences.